I just finished reading Barbara Kingsolver’s book, Animal, Vegetable, Miracle. A fabulous read, I thought, as did my book group from church. I knew that there were good reasons to buy local and all that, but it was inspiring reading about how Kingsolver’s family spent a whole year trying to eat only food grown by people they knew (including themselves). Okay, in a nutshell, here is the point: trucking and training and flying and shipping food from thousands of miles away to our grocery stores just so we can have asparagus in September or raspberries in January is taking a huge toll on our planet. For one thing, look at how much oil it takes to transport those foods so far. And another point, the kind of super-agribusiness it takes to actually pull that sort of thing off is resulting in an alarming reduction in plants and animal varieties, and that is dangerous because a nasty bug that is resistant to chemicals meant to kill it can come along and wipe out 25% or more of a certain type of food in the blink of an eye. Plus, food from far doesn’t taste as good as fresh food. So there. There’s more to it than this, but you get the basic idea. Now, here’s the reason I recommend the book. I KNEW about the importance of local and sustainable food systems and all that, but I didn’t really KNOW it in any way that translated the big issue into my own life. Reading about Kingsolver’s family, helped me to truly understand. I read and actually felt hopeful. So my book group, which is comprised of women from my UU church, read the book and discussed it at a potluck on Sunday night, and we are very excited about working together to help our own families, our church, and our community to be better stewards of the earth, to enjoy healthier and more satisfying food, and to reverse the trend of borrowing from tomorrow for the food whim of today. For the past month, as I’ve been reading, I have started making changes. We already belong to a CSA (Community Supported Agriculture) farm. But I never gave a thought to where the rest of our food came from. For the first time, I went to our city’s farmer’s market this week and got the best heirloom tomatoes and cantaloupe I’ve had in a long while. I also ran into a ton of people I know (wish I’d taken a little time to freshen up a bit before going!) Ah, I thought, I can supplement whatver I do not get each week from my CSA with the farmer’s market offerings. Good. But…where can I get locally made bread, cheese, and most importantly, grass-fed meat? Cause I ain’t goin back to no feedlot beef never never never. Well, I’ve been trying to find out about these and other options and it’s like a full-time job. I will persevere, but I wish it were easier to make the switch. And that leads me to the title of this post. Today I finally got around to checking out a local fishmonger’s shop. Okay, so that’s what I call it. Is that because I study British literature of the 19th century or do people here in 2008 USA also call a person who sells fish a fishmonger? My son, whom I dragged all around town on errands today, got a little mixed up by the word, saying fishmongrel instead. Cutie! Unfortunately, the place didn’t actually sell fish except fully cooked on a plate and all that. I thought for sure that was a fishmonger shop. Nope. No such luck. Back to more research, I guess. School starts very soon, though. If I don’t have my suppliers figured out by then, I’m afraid I’ll not be able to follow through as well as I’d like once I’m back to teaching. At least I’ve discovered the Lowell farmer’s market. Can’t wait until Friday when I can get some more of that delectable cantaloupe! Our last day in the far north of Norway, my cousin arranged for us to take a boat ride out to the island of Landegode. From every village on the coast for miles, this is THE major landmark, and even more importantly for fishermen trying to head back to shore, Landegode has been a crucial navigational aid. It is also a place almost deserted these days, with few people living there. But my traveling companion and myself were amazed to discover that many people in town have never been there. 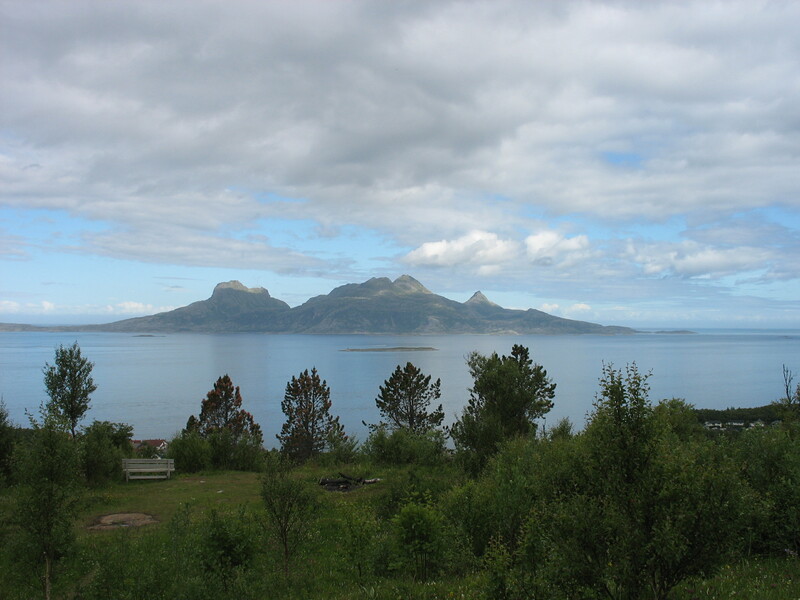 The island is very important to me and my Norwegian cousin because that is the place where our mutual ancestor lived. It was an incredible ride out to this island that rises straight out of the sea in jagged spikes. We stopped a little ways from Landegode to throw a line off the side of the boat, no bait, just a flashing lure and some empty hooks. After a few minutes of my tugging on the line up and down to fool the fish, we reeled in two lovely pollock, which we ate for lunch upon our return. The water is crystal clear, and we enjoyed an unusually calm ride out to sea. 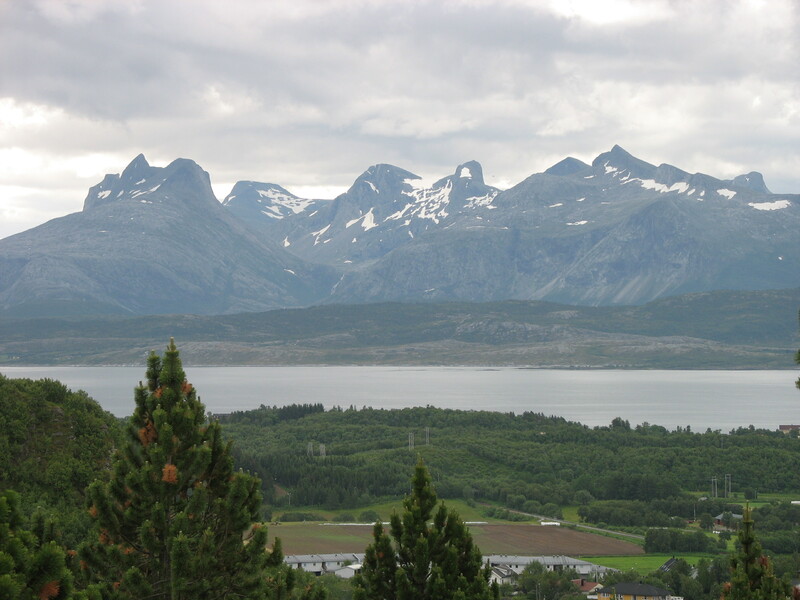 By the time we turned toward shore again, however, a cold wind picked up and the clouds moved in to obscure the peaks of Landegode. The island’s name translates into good-land. Yes, what land exists on the shore in tiny patches is good, I suppose. But more so, it is a land to inspire awe. My cousin says that when he goes fishing on a beautiful day like it was when we started, he doesn’t care if he does not catch a thing. It is enough just to view the rugged land and calm, blue sea. 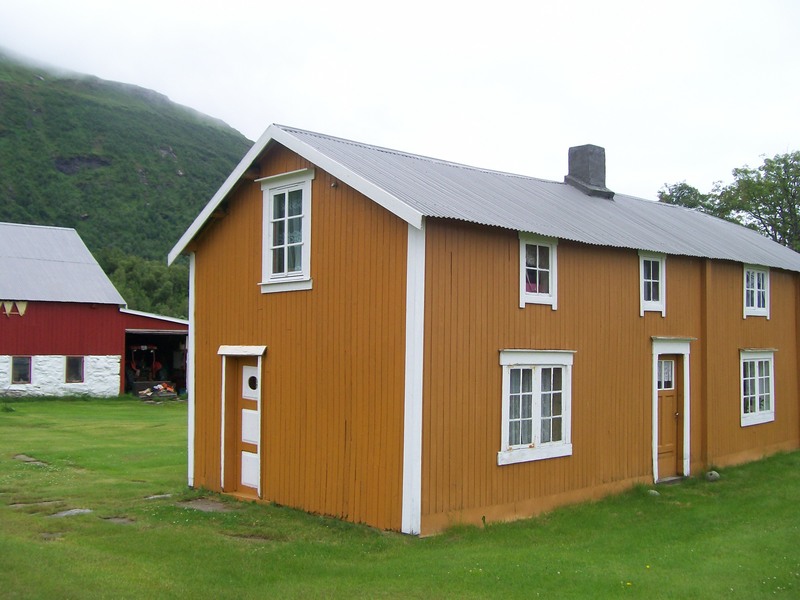 The elderly relative we visited twice during my trip, Kristianna, told us: “…beloved Landegode, most beautiful thing I know.” She lived with the sight of that good land for seventy years before moving to a nursing home. Above her head on the wall hung a painting of Landegode in winter. And so we have left the far north now, and today visited Trondheim. Tomorrow we fly to Bergen, moving south in great leaps. The next day we board a ship to take us over the North Sea to England. We are tracing the immigrants as best we can. No internet, I expect until we arrive in the UK in a few days. Meanwhile, I leave you with my hope that all is well and you are living in a good land, a land that you call beloved.